For best rates & potential discounts proceed with inquiry to Owner and we will reply personally. Our beach bungalow is designed to accommodate couples or small parties wishing to enjoy the beach and Florida weather in the privacy of a single home setting. The garden atmosphere has a full size heated pool with LED color changing lights and hot tub with small waterfall. The huge great room overlooks the garden and sets you at ease the minute you enter. We consider it our dream home and our goal is provide a vacation home to the discerning guests who are looking for something special and will appreciate it as much as we do. Every appointment has been made with loving care. And best of all, you can walk one block to the beach or anywhere nearby -, the marina, multiple restaurants, shops and the local Briny's Pub where good pub fare, music and company awaits! This home is where elegance meets comfort - we are honored to share it with considerate and caring guests. Pack lightly; we've got the rest!! Our 2 bedroom/2 bath home is perfectly situated to enjoy beach and all area activities. The 15x30 ft pool is surrounded by privacy fencing, tropical trees & foliage, with hot tub, awning covered table & chairs, sunning lounges, BBQ grill, garden swing, with pool floats, and Bch chairs, umbrellas, coolers, towels, sand toys, boogie boards, goggles, etc. it's a true private paradise. No elevators or searching for available lounges. Step outside & you're in the pool or enjoying a drink or meal beside it. Inside you'll find every possible amenity a real home offers. The over sized great room overlooks the pool paradise and allows for watching the kids while enjoying a movie or checking your email. From DVDs, CDs, DVR cable, wifi, printer, games, stereos, laundry closet, piano, to all staples & even coffee, & teas, you'll truly only need bring your clothing & stop at the local grocery. Everything else is provided. Only additional fees are: a one time technology contribution of $20 to help us provide the wifi, DVR cable, & unlimited long distance to anywhere in the US/CA, The caretakers fee ($150 -2019)is to cover the cleaning lady & outdoor man which we request you leave upon check out in cash. Upon booking, you will receive your personalized reservation package. Filling out the last page, it must be returned to finalize booking. Other Attractions & Activities: As an alternative to the Ft. Lauderdale airport, the Palm Beach airport is 35 minutes drive and has discounted fares. 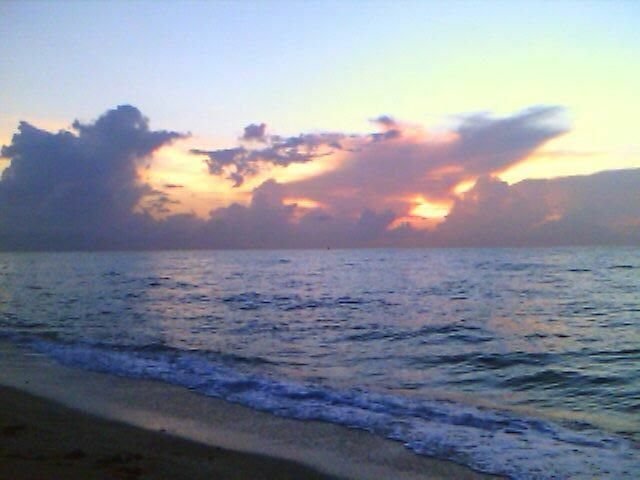 Since Pompano Beach is between Ft. Lauderdale and Boca Raton it is truly the best place to be to visit both. And should you want to explore Miami's South Beach, or dine at the world famous Joe's Stonecrab Restaurant, the drive is about 45 minutes south on I-95. The beautiful FL Keys is a 2 -4 hour drive depending how far you'd like to go, but John Pennekamp Park, with its snorkel trips and glass bottom boat trips is in Key Largo and could easily be a nice day’s trip. Key West at about 4 hours, but is surely worth it! If you'd like to combine your South Coast visit with a visit to the Orlando/Disney area, we have contacts there. Will be happy to provide you with their web site. (3-4 hour trip). No matter your interests, there is always plenty to do or not to do depending on your mood. Most guests end up walking the beach & hanging out by our private pool & garden. Additional Rental Details: Children under 12 years of age are permitted, however, our pool is NOT fenced nor the home baby proofed. Security system beeps when doors are opened for safety. All guests (excluding children) must be at least 25 years or older and a copy of a driver's license must be included in the reservation deposit. Daily or other domestic services can be provided at an additional charge (paid to cleaning lady separately) if desired. For stays of 3+ weeks, caretaker comes weekly to treat spa and yard. Pool man comes twice (2 x's) weekly. Doug & I are the proud owners of an Appraisal Co. & our special beach & private pool house. It started as our stay-cation home while we cared for our elderly parents. We decided that sharing our home with other families would be paying it fwd as we've visited England, Scotland, Hawaii & Italy all in vac rentals. We have complete privacy w/every amenity. Given the close proximity to the ocean, over the past 12 years,we've met people from all over the world & become close friends with many. Most of our guests return year after year. We welcome our guests both new & previous with open arms. It's our sincere pleasure to provide a quality Bch house with the warmth of a real home away from home. When we say bring only your clothes & food, we mean it. The 2 things that all gsts seem to say is 'Wow-the pictures don't do it justice & we've never seen a vac rental with everything provided'. We set it up the way we'd want it. I'm such a stickler for cleanliness, that I have 4 sets of Linens which are sterilized & switched between each turnover up to the 4th time when we start over again. In 2005 we added a cabin in Helen, GA to be near our families in Atl & Greenville, SC. It's an amazing part of the Blue Ridge Mtns where the Appalachian Trail begins. Our dream was to spend our retired years in FL & the GA Mtns. But, retirement looks to be much further down the road than we'd hoped so the cabin is up for sale as a 2nd home completely furnished & in spotless condition enjoying a cup of coffee on the front porch rocking chairs overlooking Mt. Yonah in the mornings or a glass of wine at sunset. We're heartbroken to see it go after putting so much love into it. But, some nice couple may come along and know right away as did we that it was the perfect Mtn getaway for us & our families. We will be holding onto our beach bungalow until investors convince us new townhomes might be just right for us. For now, we'll look fwd to greeting you when you come to visit our home. Our home is very rare. Many older properties on the beach are condos, but our block is quiet & all single family homes. Its only short walk to the very private 4th St beach entrance. The extremely private tropical pool area is quiet and relaxing. No elevators up & down to get to pool or bch. Every convenience & amenity provided. All for the price of a hotel room. Pictures will never do it justice. Come see it & enjoy it at your leisure. You'll be as pleasantly surprised as are all our personally greeted guests. We meet your every need! No large property mgmt companies for us! Your comfort and care is our #1 objective. Those co's have too many properties & not enough staff to care for them. Our caretaker Rick can't do enough should you need his services. We are a family here for yours. Standing in our driveway, you can see the beach entrance. The floor plan is perfect for couples or families w/ children. The completely private pool & garden allow enjoyment of the whole garden atmosphere. As a frequent user of vacation rentals, we've set it up the way we'd want it to be. Nothing forgotten & everything at your hands reach. Most guests are over joyed when they see the home & comment frequently that we've thought of everything. We love being in the memory making business! toilet, shower, Brand new shower w/ tiled seat. Renovated master bathroom is very large, marble floors, pedestal sink, chandelier, roman tub, European and upgraded fixtures. Hand held shower spray in Roman Tub. 2nd bath is adjacent to 2nd bedroom bedroom w/ brand new shower w/ tiled seat. Can see Bch entrance from our driveway. Our Bch is primarily used by locals. May tag Neptune-up & down. Plenty of parking for 4-5 cars. Vaulted ceilings gives great open spacious feel. The full service galley kitchen has Corian counters, Subzero refrigerator, gourmet oven, dishwasher and all dishes, pots/pans, serving ware, glasses, stemware and martini glasses, flatware, and more.. In all bedrooms as well as great room. Tons of books and magazines- from Travel - novels, some in German. Many games, puzzles, children toys and games too. From coloring books to Barbies, cars, horses, baby items. Many DVDs of most genres-kid friendly too. Very tropical both front & back especially around pool & patio. Full size privacy fenced (15x30) Many pool floats of all sizes, noodles, etc. heated in winter. Circular spa Seats 4, reclines 2. Natalie and Doug's house is really a gem. It has a nice, clean pool and hot tub; it's very easy walking distance to the beach; as well as walking distance to grocery stores and restaurants. The home itself has everything you need to be comfortable, and Natalie personally saw to it that we had everything we needed. Next time I'm traveling back to Fort Lauderdale, this will be the first place I look into. Great location, proximity to beach, restaurants! Natalie went above and beyond to make us feel at home in beach house. We loved the very private yard with pool, birds, butterflies and iguana! The three weeks we spent in Pompano were wonderful and we hope to come back! My wife, daughter and I were welcomed with warmth and hospitality from the moment we came to our stay at this wonderful home. The accommodations were in abundance along with all the amenities. We felt like it was home and never did without anything. I would highly recommend a stay at The Beach House! Natalie thinks of everything. Would go back in a heartbeat. Accommodations were perfect. The property is laid out very well. You feel like the pool and hot tub are in a secluded area. The rooms have everything you need from tons of towels to comfortable furniture. Nice large table to eat at. Natalie is a vary hands on owner who does everything she can to make your stay spectacular. Perfect couples retreat. Private beach access. Private pool. Everything needed in close vicinity. Natalie was wonderful making sure we had all the comforts we needed! Awesome Heated Pool, just a couple blocks to beach/restaurants! We had an amazing time as this property. Natalie was so accommodating that she met us at the house and ran through everything we needed to know. Our little boys got their own room and the parents got a huge master bed. Natalie had everything we needed to enjoy ourselves, board games, pool/beach toys, dvd’s. The living room was huge enough for us all to hang out and the patio was perfect to each lunch outside everyday. We kept to the same schedule of walking two blocks to the beach every morning, heading home for lunch, swimming in the afternoon and back to the beach before dinner. There are at least 6 restaurants within walking distance that we had a lot of options. The pool was definitely the highlight of the trip. Nice and warm for the boys anytime they wanted to jump in while the parents could lounge on the floaties soaking up the sun. Plus when we put the boys to bed, my wife and I could hit the hot tub and stare up at the stars. Natalie couldn’t have been nicer and you could see it was her duty to make sure that we had the best vacation possible. It was such a relaxing and inviting house that it made it really painful to leave. Walk to beautiful Pompano beach (one block), boat rentals, fishing charters, diving/snorkeling trips, waterfront restaurants, pubs, ice cream parlor, Walgreen’s pharmacy, convenience store, Bank, ATM, fishing pier, and more. Nearby gourmet fresh fish market, salons, grocery stores(s). Pompano Harness Race Track and 'The Isle' Casino newly renovated is 5 minutes west. 2 miles to public golf course (lighted holes for night golfing). Executive Airport, 5 minute drive. Ft. Lauderdale airport is a 20-minute drive and elite Las Olas Drive, with the finest restaurants and boutiques, is a short 15-minute drive. Science & Discovery museum at end of Las Olas & Riverfront is filled w/ restaurants, shops. Ft. Lauderdale Beach Place is south on A1A approx. 10 minutes. Perfect place to p/u water taxi to see all waterside locations as well as the amazing yachts and mansions. (Stops at many restaurants/bars/shops where you can jump on & off at your leisure. Hard Rock Hotel and Casino is about 30 minutes south. Broward Center of the Performing Arts is near Las Olas and they have Broadway Musicals/Shows during all seasons. Many restaurants have special dinner theater menus both pre and post show. Other Activities: Sporting events - Hockey Arena adjacent to Sawgrass Mills Outlet Mall (largest high end outlet mall anywhere) in Sunrise about 20 minutes drive, Baseball, basketball and football arenas in Miami - 45 minutes away.Swap Shop (Sunrise Blvd exit off 95 & Festival Flea markets (Pompano Beach at Sample Rd & FL turnpike) are the perfect places to get great bargains. Buy a duffle bag to bring home all your bargains. Golf: Check on line for Pompano Beach Public Golf Course - only about 1 -2 miles away. Reasonable rates and close. Palm Aire is about 10 minutes west, public and very nice. PLZ contact us for revised quotes. We always give discounts and deduct sec dep from auto rates. see above for coverage w/credit card. Rates up to 4 persons (2ad/2ch or 4Ad)over 5+ gsts $20 per pers per nite) - Minimum 4 night stay,Check our calendar-Call for more information on last minute discounts. We suggest weekly bookings, we consider nightly rates for fill ins-All staples & amenities provided.Winter dates almost gone.